for Inkjet Printers, 2¼" x ¾"
Add a touch of gold to your envelopes to let recipients feel special. 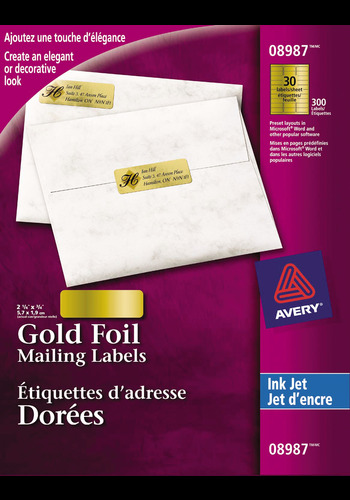 Gold Foil Mailing Labels offer an elegant look on invitations, announcements, and letters. The glossy foil finish will still deliver brilliant colour and sharp text quality for all your envelopes. Create elegant, decorative labels with free, easy-to-use free templates using Avery® Design and Print Online. Then print from your inkjet printer for professional-looking results. No matter what the occasion, these mailing labels show up at the door looking dressed to the nines. Label Size 2¼" x ¾"